Samsung Galaxy Gear Firmware Update is an easy process to do not hard as you think, you just need to keep focus on all steps to do it the right way. Samsung Galaxy Gear Stock Firmware Update is an important step for your Gear Smart Watch. If you are looking for a simple and step-by-step Tutorial/Guide to help you installing/updating your current official firmware, so you are at the right place. You should know that there are many types of Firmware updates (It’s extra info for you). Sometimes you get a new update and install it, but after installing it, you will find your current Tizen version is the same. This kind of updates in most cases is a Security Updates to fix bugs, errors, and vulnerabilities. There are another types such as Firmware update that will upgrade your current Tizen version. This Guide will help you to get your new firmware update Automatically or Manually, so don’t worry I explained all methods here to help you get this update without problems. This Tutorial/Guide will help you in all Tizen versions. So if you have Samsung Galaxy Gear Smart Watch and want to get the latest update for it such as (Tizen 2.2.1.1, Tizen 2.2.1.2, Tizen 2.2.1.3, Tizen 2.2.1.4, Tizen 2.2.1.5), you must know that there are several ways to Install Galaxy Firmware Update, these ways are, the official method and the manual method. The manual method is not recommended if you can get the Galaxy Firmware Update with the official method, so I advise you to use the manual method only when you can’t get the Tizen Firmware Update with the official method. Now I will help you here to get the update your Samsung Gear Firmware through both ways by following the following instructions to install the Tizen Official Firmware Update on your Smart Watch easily. You can choose one method only from the following method to Update Galaxy Tizen Smart Watch, both methods have the same result, so it doesn’t matter what is the method you will use. It’s recommended to update your Firmware to fix bugs and Errors. Firmware Update also will increase the performance of your Samsung device and sometimes add some features. Yes Android team are NOT responsible if you bricked your device or for any damage may cause in your device by doing something wrong through the instructions in this tutorial, so be careful please and do that the right way and at your own risk. Above all else and the most important thins is you must NOT use this Firmware Update with any other model number, the firmware that you have just downloaded is only for the Model number mentioned in the Firmware Post page. Also before starting the Firmware Updating process (Specially the Manual Method) please create a Backup for your important data to avoid data loss. Make sure that is your device battery is fully charged or 75% at least. Install/Update Galaxy Gear S Watch Tizen Firmware with the official method. Run Kies on your computer and make sure that your Computer is connected to the Internet. Connect your Samsung Galaxy Gear S Watch to a USB port in your Computer via USB data transfer cable. Wait for your device to appear on the upper left side of the window. Click on the device name (e.g SM-R750V). A new window will appear on the right side of Kies. Under the “Firmware Information” tab, see if there are any updates available. If there, you should see the message ‘New Firmware is available‘. If you want to install this update on your Samsung Gear S Watch, press the ‘Firmware Upgrade‘ button. A new window will appear. The process contains more phases: (‘Download’ ‘Upgrade’ ‘Complete’). At the end of the installation process your device will reboot. Now you can disconnect the cable from the Computer and your phone. You can verify if you have the Latest Firmware update for Samsung Gear Smart Watch by going to Settings > More> About Phone, and you will see the new Firmware version details. Install/Update Galaxy Gear S Watch Tizen Firmware by using a Windows based tool called Odin. Through this method we will install the Latest Official Firmware Update with Odin, so if you want to Install/Update Galaxy Gear S Watch Firmware with Odin, follow the following steps carefully. Download Firmware Update File for your Samsung Galaxy Gear S Watch from the Samsung Gear Firmware Page. Extract the firmware .ZIP file to any place in your Computer with any decompressing software such as 7-Zip, Win Zip or Winrar. Extract the Odin .ZIP file also to any place in your computer. Download and install Official Samsung ADB Drivers . 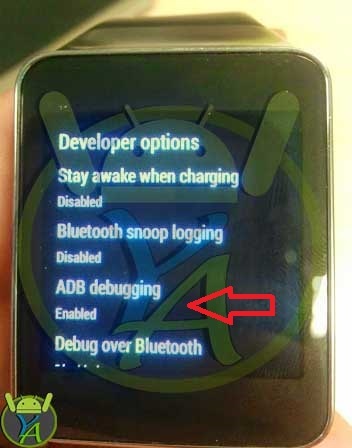 If you already installed Samsung Kies then you already have the ADB Drivers , If not go to this page and download the Official ADB Drivers for your Samsung Galaxy Gear S.
Go to your Gear’s settings and enable ADB/USB debugging. Note: Developer Options is hidden by default, so if you can’t see the Developer Options in your device settings ,go to Settings > Gear info > About Gear > Press 7 times on Software Version to make Developer Options Visible to you . Now you can enable ADB/USB Debugging Mode in Developer Options. Turn off your Galaxy Gear and now turn it on into the Download Mode. If you don’t know how to enter Download Mode see the following instructions. To enter Download Mode press and hold : ” Power Button “ you will see the Power off and Restart options showed on the screen , Keep holding on the power Button until you see the Samsung Galaxy Gear logo and you will find under it “Rebooting” option as shown in the following picture, when you see that, press on the power button 5 times and you will see another screen showed, then press on the power button one time to select “Download”. After selecting the Download Option, Press and Hold Power Button for 3 seconds to enter “Download Mode”. See the following pictures. Start Odin on your Computer (You Need To Run Odin as Administrator). Connect your Galaxy Gear S Watch to your PC via USB data transfer cable. Check “AP / PDA” box, then click on “AP / PDA” and add the .tar.md5 file from the .ZIP extracted folder. Important!!! Do NOT place anything under the “PIT” section and make sure that “Re-partition” is not checked (On the left side you will see Re-partition under the Options tab or PIT tab in the newer versions of Odin). Make sure that you only checked these options on Odin (Auto Reboot, F. Reset Time), See the image below. When the .tar.md5 file is loaded you can press Start to begin the Firmware Installation Process. Don’t move or touch the USB Cable while the Firmware is being flashed. Finally you will see a message saying PASS!! with a Green background as shown in the below image. That means that the Firmware Update is successfully installed. Your device should reboot now and run on the new Firmware. Finally I hope this tutorial helped you to Update you Samsung Gear Smart Watch Tizen Firmware. Share your experiment with us on the comments and help us by Sharing this Guide/Tutorial with your friends.